The Federation believes that a strong and sustainable community social services sector must have access to high quality and affordable insurance products. As such, Federation member agencies have access to a suite of insurance programs that provide high quality, comprehensive, and reliable insurance products and services at a reasonable cost. Our insurance providers deliver excellent service to members and tailor coverage to agency and employee needs. 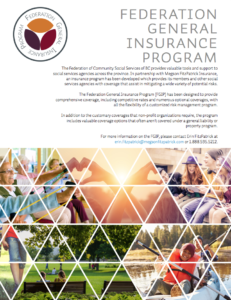 Federation members and sector partners can purchase insurance programs through our providers at Schmunk Gatt Smith and Associates (Health, Dental, and Disability Insurance) or Megson FitzPatick Insurance (General Insurance). Doing so helps benefit The Federation’s financial operations—enabling us to do even more work advocating for and improving BC’s social care sector. For information on accessing Insurance Products through The Federation as a non-member, check out our Benefit Affiliate Program below or contact The Federation office. In 1984 we began working with Schmunk Gatt Smith and Associates to develop the Federation Associate Benefit Plan. Thirty-one years later the plan is one of only three plans compliant with the requirements under BC Community Services Collective Agreement. Organizations with as few as three staff members are eligible to participate in the program. We believe the provision of solid health benefits is an important part of recruiting and maintaining a skilled workforce in the social services field. Through our strong partnership with Schmunk Gatt Smith & Associates, The Federation Association Benefit Plan (FABP) has been successfully serving member agencies in the community social services sector since 1983. The FABP is one of only three fully insured plans that have been accepted as compliant with the terms of the BC Community Services Collective Agreement. As such, this plan is a great choice for both union and non-union agencies across the province. All of the plan’s providers are “A-rated” and known for their quality, accountability, and track records. Effective October 1st, 2017 the FABP changed its Long Term Disability carrier to Desjardins Insurance resulting in lower and more stable LTD rates for our membership. The FABP has also partnered with the Preferred Pharmacy Network and Pacific Blue Cross to offer member agencies savings to dispensing fees and drug markups helping to maintain coverage levels at reduced prices. The FABP has worked with Acclaim Ability Management—a leader in disability and claims management in Canada—since 2009 and they continue to be a valued service to participating agencies. 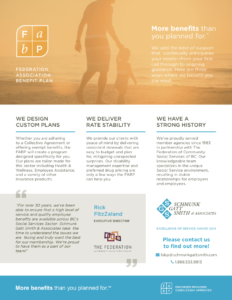 For more information about The Federation Association Benefit Plan check out the FABP Brochure. In 2015, The Federation announced a new partnership with Megson FitzPatrick Insurance in order to provide a range of new insurance products for members. These include property, directors liability, and misconduct insurance. We believe that managing risk is an important part of ensuring that BC’s community social services are there when people need them most. The Federation General Insurance Plan (FGIP) is offered in partnership with Megson FitzPatrick. This is a flexible and competitive insurance program available to our members administered by a company that, from day one, has demonstrated a strong commitment to customer service. The team at Megson FitzPatrick Insurance can provide you with insurance that works for the unique needs of your agency and can offer various insurance options specifically tailored to your needs. The Megson FitzPatrick Insurance team are happy to provide risk management support (where required) to members enrolled in the FGIP. These strategies can help you safeguard your organization from (or mitigate the impact of) future losses. Check out the FGIP Brochure for more information. Megson FitzPatrick Insurance has also provided Federation members with toolkits on Cyber Liability and Compliance with Canadian Anti-Spamming Legislation. Federation members can access these resources in the member’s section of our website. Megson FitzPatrick is a proud supporter or our community, and each year they help raise and donate over $35,000 towards regional charities. They believe in supporting their clients and will make every effort to help raise funds and awareness to support vital services. For more information on MFI’s community vision and the application for funding, please visit the MFI website. The Federation is thankful for our partnerships with both insurance providers—Schmunk Gatt Smith and Associates & Megson FitzPatick Insurance—and for their ongoing support of our conferences and provincial gatherings and their hosting of the popular networking receptions at these events. They truly understand what it means to be Altogether better. Community social services organizations who are not members of The Federation and who wish to purchase insurance products may be eligible to do so through our Benefits Affiliate Program. Contact The Federation office for more information.